What are the basic doctrines of the Emergent Church Movement? Dr. Reagan and I on our ministry's television show Christ in Prophecy had the pleasure of asking this question of Eric Barger of Take a Stand! Ministries. Eric is an authority on the cults, the New Age, and rock music today. From his past as a former drug addict and rock n' roll musician who was deeply involved in the New Age movement, Eric has emerged since he gave his life to Jesus Christ to become one of today's greatest defenders of Christianity in America. He joined us to talk about the greatest threat to the Church today — apostasy, particularly from the Emergent Church Movement. 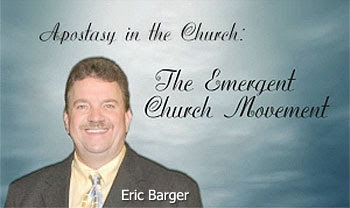 Eric Barger: The problem is that the Emergent Church Movement really doesn't have doctrinal standards. They have changed the doctrines of the faith. I sat in an Emergent Church conference where one of the key speakers who would be considered the godfather of the Emergent Movement redefined different terms in the Bible. Brian McLaren said the term "the world" in John 3:16 is really about us saving the earth. He could read John 3:16 as meaning, "God so loved the world that He sent the Emergent Church to save the planet." These folks are very much into Dominionism and Kingdom Now which hold to the idea that they have all the answers and we are going to be one happy religious family here on the earth. The Emergent Church has a doctrinal problem. In fact, they believe in the disillusionment of what they would call "cold hard facts," which we would call doctrine. The word doctrine has become a dirty word in a lot of their circles. They have decided to preach the plans of men instead of the plans of God laid out in the Bible. Staggeringly, that is what so many pastors have jumped on board and done. I encourage pastors that they need to come back and preach the Scriptures. Preaching the Word is what their people need. That is what we all need. But, they want thy disillusionment of "cold hard facts" in favor of a more warm and fuzzy subjectivity. The Emergent Church also believes that evangelicalism and fundamentalism have failed us and that those ideas should just go away. They've really adopted a more mystical idea that is more closely aligned with the New Age Movement. They believe there is much more than just the Scripture. Yet, they still call themselves Christians and Evangelicals, which has caused these labels to cease having any meaning. The Emergent Church Movement leaders should just be honest and come out of the closet and tell people that what they believe in is not Christian since they are advocating many things that the Scriptures speak clearly against. It's a redo really of what happened 150 years ago with the re-emergence of the old liberal Social Gospel, though today it can grow much quicker because of the advent of our modern technology and communications. Dr. Reagan: The primary Emergent belief seems concerned with saving the earth. They have no concept of Jesus coming back anytime soon. In fact, Bible prophecy is a laugh to them. They believe we are going to go out and save and conquer the world and that one day we will give the Kingdom over to Jesus. Eric Barger: That's right, they believe we are going to facilitate Jesus' return. You will also find the environmental movement really steaming under the surface of the Emergent Church Movement. They have as well a disillusionment of Christian doctrine and really don't want to hang onto it. They believe that the doctrines of the faith are really immaterial and this is why they've join hands with Ecumenical Movement and with all kinds of other religions. In truth, they really have become their own cult. I've been saying openly that they really should just admit they are not Christians. What they are doing is not biblical, not Christian. Of course, they don't want to talk about doctrine. Anytime you mention doctrine to them in any kind of a debate whether it is online or through emails or in person, they run for cover. Dr. Reagan: I understand a lot of these Emergent churches take the approach to preaching by getting up and saying to their congregations, "Okay, we are going to talk this week about the Virgin Birth. So, what do you feel about it?" They actually ask people in the audience to get up and make comments on the Bible based on their feelings. Whose to say then who actually is right and who is wrong? Eric Barger: In liberalized circles or Emergent circles, if you ask them all to discuss the Virgin Birth they will conclude that Jesus was not born of a virgin. If Jesus wasn't born of a virgin then we are still all lost, and so I would question why in the world would we want to be in church Sunday mornings if Jesus wasn't the Messiah. In the next part of this series on the Emergent Church, Eric will explain who Jesus is to them. your new poll requires another option. I cannot vote because none of these include it. The extra option I propose is "a combination of the above"
I say this because I do not believe ALL religions will be joined. I believe only the gnostic related religions (including apostate Christianity) which teach that we can become gods and those related to oldtime Babylon beliefs like the Catholic Church. I do not believe Islam will be part of this. Anony mouse wants another option for the poll picking a “combination of the above" – why the need to be pedantic? As Islam is an apostate rendering of The Old and New Testaments, I see good reason for the remnant left after Gog Magog to be in dire need of some kind of support, so why couldn’t they be included? Anyway surely that would fit under ‘something entirely new’ it’s near enough and just for fun. So why procrastinate your vote? If it isn’t ‘spot on’ – Nathan hasn’t shot anyone yet! Fist off I am not for a walk that does not make Christ central. At the same time I am intimately acquainted with fundamentalism and how it works. Nothing much more than control. I have spent many years deprogramming from that nonsense. Yes there are fundamentals of the Faith. Paul made it very clear what they are. The greatest of which is love. That born of the grace that was extended to you and me when we accepted Christ. In 30 + years in what is portrayed as fundamentalism, I can say most assuredly, that that same Grace is not very often extended to others. They tend to carry big sticks and beat already hurting people down further. Who did Jesus say would teach us in all things? Not Bob Jones or Assembly of God or any other of the many controlling institutions out there, but the Holy Spirit. Yes he may use people to do the work. He doesn't have to and many times doesn't. We do have a social obligation. But that gets taken to extremes, to the exclusion of Christ. Not right either. Jesus rebuked the religious leaders of his time. Telling them they belonged to there father the devil. Why? They thought they had it down, and they could be told no different. I see very little difference in many of the religious institutions today. I got news for you, I do not think I was even saved till I let go of the stick. When I did I was met by something more sweeter than I ever experienced before, and I have had many experiences. It is the hardest thing I had to do, letting go of my theological bricks that kept me safe. However when I did I really started to experience the work of the Lord in my life. What is important for salvation? Or in other words, what is the core of our faith? The Apostles Creed makes that clear. The rest are chains used to tie you up. Or fluff to enflame your pride. How did I start deprogramming? By being honest with the Lord. Lord, I like carrying a big stick, I know it is wrong but I seem to be addicted to it. Please change my heart in this matter. I wasn't hiding anything, and I needed to admit that. Like Thomas, help my unbelief. Spiritual things are spiritually discerned, and I am sure I will be beat on for this stance. Jesus said as much. This Americanism is unfamiliar to me ... I may have misunderstood? Do you mean 'beat upon' as portrayed in your above testimony? to their self-righteos superiority complex. It's the allegory they confuse themselves with that does it. Such Grace is conspicuous by its absence as he dreaded LS raises its head like an over bloated puff-adder. Don't fret, I shant really tell you what I think - its taboo you see. Then I expect you already know that. I can't tell if all 3 comments are from 1 'Anon', or 2 [or 3]! Just to make life a little easier for you [and us, in sorting out all the Anons], using any 'Name' or 'Alias' makes it a little more personable if we see you comment frequently, instead of wondering if 14 other Anons have each made separate comments, PLUS this will save you a little time too for any of your future posts. When you post, click on the "Name/URL" button instead of the "Anonymous" button, and it opens up 2 little windows; 1 for Name, and 1 for URL [marked "optional"]. If it does, you're good to go, and then click "Publish Yer Comment"! The advantage of doing this is that your own com-putter will remember that name for next time [the public library don't remember nothin']. So "Gary" for example, if you have typed in the whole thing "Gary from Indonesia" in the "Name" window, the next time you post, when you click on the little "Name" window and type the 1st letter [G], another little window will open right below with "Gary from Indonesia" in it and all you have to do is click it and then click preview to make sure your post will say "Gary from Indonesia said...", and you'll be good to go again. Thanx for finding & retrieving my post ! I wuz totally mystified why "Blogger" wuz sending me to spam here when I was still good2go on other sites!?? Must be Obummer! His insecurities!... Yes! ...especially since even Jimmy Carter just compared him to --> Jimmy Carter!!! It was about idiom, not grammar. We say getting 'beaten up'! I wasn't sure what you meant by 'beat on' other than switching on a metronome for music practice.